"ART Fahrenheit 451: Sailing into the sea of oblivion"
Chapter 5 "Impersonal drifting: Still Moving"
１This work does not "recreate" the "Court" series exhibited by Hayashi Goh + Nakatsuka Hiroko at the Kyoto Independent Exhibition (1983–85), but rather draws out new developments that even Hayashi + Nakatsuka had never imagined before. In order to do this, the material, scale, structure, and composition of the original works are changed. 2 Hayashi + Nakatsuka were not consulted for any aspect of this exhibit. They are strictly positioned as outsiders who are not present in this work. 3"Heart-warming relationships" of nostalgic introductions and historical reevaluations of the past are avoided at all costs. 4By making the author "impersonal," the project takes the unique position of being simultaneously inside and outside of the triennale. 5The cyllindrical space of the Japanese Supreme Court is used in this construct. 6It is not presented chronologically as a Tennis Court (1983), Courtroom (1984), and Jail (1985); it is presented as a relative "model" on the same plane. 7The jail is displayed in the art museum's corridor. Mirrored surfaces are placed on both sides at 45 and 90 degree angles so that the entire Yokohama Triennale becomes a temporary jail-like structure. A turn coat is a traitor; turn court means the overturning of a trial. Turning also calls forth the image of a record turntable, and in a "red courtroom" DJ turntables are placed on the desks of the prosecutor and the defense. An electronically hammering gavel for trial use is placed on the giant judge's bench. A rapper will "rap the Constitution of Japan" from the bench. 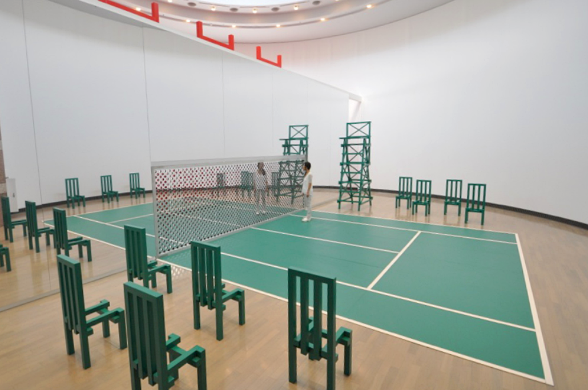 The project consists of models of a red courtroom, a blue jail, and a green tennis court, and occupies the cylindrical hall and corridor of the Yokohama Museum of Art. These models are brought together through mirrored surfaces which change their scale. A visitor drifting though the huge model takes on the multiple roles of judge, defendant, attorney, prosecutor, spectator, player, referee, guard, and prisoner.